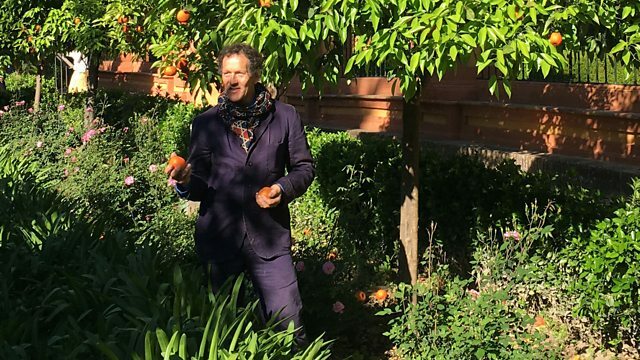 Monty Don explores paradise gardens in grand Spanish palaces and secret Moroccan courtyards. And in the Iranian desert, Monty unravels the mystery to their creation. In this series, Monty travels across the Islamic world and beyond in search of paradise gardens. The Koran, the holy book of Islam, tells of these magical places - green spaces filled with flowers and fruit where shade and water provide a safe haven from the harsh climate that dominates the Arab world. For Muslims, these gardens are an earthly vision of the real paradise awaiting believers in heaven. Monty starts in Spain, a country synonymous with Christian traditions but which, for 800 years, was actually Islamic. At the Alhambra, he discovers the basic building blocks of paradise gardens - green spaces divided into four by channels of water that meet at a central fountain. In Seville, Monty explores their symbolic significance. Water is the key feature of these gardens. In the desert, rain was a mercy from heaven. The channels of water that divide the garden are representative of the four rivers of heaven: water, milk, honey and wine. The repeated geometric shapes seen in the fountains and rills are symbolic of heaven and earth and the flowers and fruit provided heady scent that beguiled the weary desert traveller. In Morocco, Monty discovers the wide variety of paradise gardens. He begins just outside the city of Marrakesh in an enormous royal walled meadow, The Agdal. From there, he moves to the heart of the town, where he comes upon a tiny garden where huge banana plants jostle with palms to create a secret paradise garden, a shelter from the busy world outside. And in another part of the city, a rundown old palace has been turned into a stunning contemporary garden with a twist. But it is Monty's final stop that sheds the most light on the origins of these incredible gardens. In Iran, he explores the huge influence emanating from the gardens of old Persia. In the cultural centres of Isfahan, Kashan and Shiraz, Monty visits some of the most exquisite gardens in the world and then in the middle of the desert, comes across the secret to their creation. At Pasargadae lie the ruins of the 6th-century palace of Cyrus the Great, and as recent excavations show, at its heart there was a garden. The garden was divided into four, representing the sacred Zoroastrian elements of water, wind, fire and earth. When the Arabs invaded Persia in the 6th century, it was these Zoroastrian gardens that influenced their ideas not only of what a garden should be, but of paradise itself.